Note: Net interchange values are aggregates of reported metered flow values on transmission tie lines between balancing authorities. Reposted at 2:30 p.m. on Tuesday, February 7 to correct the units in the text and figures and to clarify the California grid region. In 2016, the California grid region, which covers most of the state and a small portion of Nevada, imported a net daily average of 201 million kilowatthours (kWh) throughout the year from other western regions, or about 26% of its average daily demand. Those imports were supplied by the other two regions that make up the Western Interconnect (WECC). The Northwest region of WECC, which includes most of Colorado, Idaho, Nevada, Montana, Oregon, Utah, Wyoming, Washington, and a small area of northern California, supplied a daily average of 122 million kWh. The bulk of the remaining imports to the California region, 68 million kWh per day on average, came from the Southwest region of WECC, which includes much of Arizona, New Mexico, and small portions of Nevada and Texas. 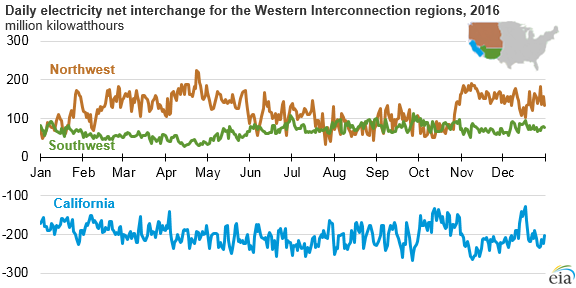 Daily net interchange values reflect the sum of hourly electricity flows on transmission lines between the balancing authorities that manage regional electric production and consumption. 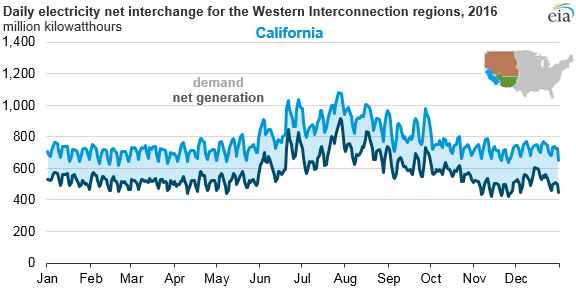 Despite net daily imports, on an hourly basis, the California region sometimes exports electricity. Although in aggregate these regions reflect overall importing and exporting trends, the net flow of electricity for an individual balancing authority within each region may differ from the overall regional totals. WECC is one of three electricity system interconnections, or networks, that cover the Lower 48 states. WECC consists of 35 electricity systems, or balancing authorities, that generally extend from the Rocky Mountains to the West Coast and include portions of Canada and Mexico. The California region includes five balancing authorities, by far the largest of which is the California Independent System Operator (CAISO). In 2016, electricity generation for the U.S. component of WECC totaled 724 million kWh, but the system demand, or load, totaled 728 million kWh. 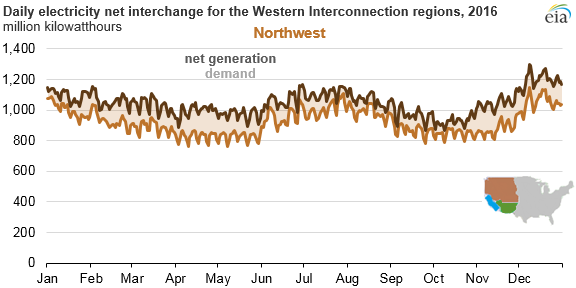 Mexico, Canada, and direct-current interties to other U.S. interconnections made up the net difference between total generation and demand. System demand differs from end-use electricity consumption in that it includes a small amount of electricity lost to heat and other factors in the transmission and distribution system. In addition, system demand is reduced by the output of distributed generation sources, such as distributed solar photovoltaic (PV) installations. California currently leads the United States in distributed PV capacity. More than half (53%) of WECC’s total net generation in 2016 came from the Northwest region, although that region represented less than half (46%) of total demand. 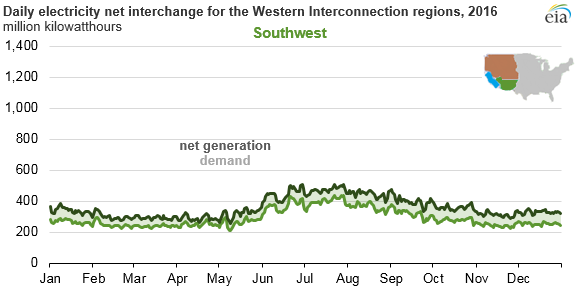 The Southwest is the smallest of the three regions in WECC, making up 18% of net generation and 15% of system demand in 2016. The California region’s net generation of 210 billion kWh accounted for 29% of the total generation within the WECC in 2016, while its demand, at 283 billion kWh, accounted for 39% of the regional total. The daily peak in system demand for the California region and the entire Southwest occurs during the summer, driven by air-conditioning load. Conversely, the heating load drives peak demand in the Northwest, where the daily peak during 2016 was on December 8. In 2016, EIA began collecting and publishing hourly electricity operating data, including actual and forecast demand, net generation, and electricity interchange between electric systems. The survey includes data from all 66 electric system balancing authorities that make up the Lower 48 U.S. electric grid.